Pioneers in the industry, we offer plastic screw barrel and extruder barrel from India. 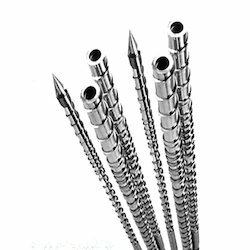 We have gained rich industry experience in this domain in offering a wide array of Plastic Screw Barrel to our valued clients. We provide these screw barrels for any type of extrusion machinery like plastic extruder, jerry can plant, recycling plant, reprocessing machine, blown molding plant, and monofilament plant. Furthermore, offered range is available at reasonable prices. Our vast industrial excellence has enabled us to manufacture highly reliable Extruder Barrel. These barrels are developed under special supervision of our experts, who make sure to set bench marking standards in developing robust quality barrels assuring durability. Developed from best quality stainless steel alloy the offered barrels are heat treated and available in the choice of diameter at a nominal price.